This year marks the centenary of one of the most fey and delicate fantasies ever to be published, Dream English: A Fantastical Romance by Wilfred Rowland Childe. It describes an imaginary England where neither the Reformation nor the Industrial Revolution ever happened, and all is (perhaps somewhat optimistically) an arcadian idyll of old stone cottages, arts and crafts, and a fervid mysticism. It might perhaps be best described as a mixture of William Morris, Arthur Machen of the Grail romances and the aesthetic Catholicism of the decadent poets and artists of the Eighteen Nineties (such as Ernest Dowson, Lionel Johnson, John Gray, Aubrey Beardsley). Childe’s prose is highly mannered and lyrical and draws upon figures and symbols from medieval romance. 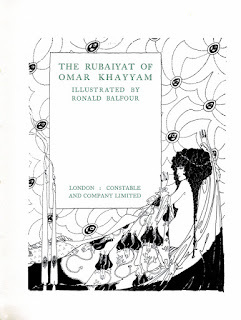 I remember finding my copy, appropriately enough, at the gatehouse to Hay Castle, then in use to sell fantasy books, and at the same time another book which shares some of its qualities and tastes, The Symbolic Island (1925) by Kenneth Ingram. There is a sort of drifty dreaminess about Childe's book which makes it quite exquisite, but it also has a strong determination to exclude modernity and celebrate the author's clear vision of a might-have-been. Childe was known in his time as a minor poet (using the term in its precise and not dismissive sense), and his volumes The Gothic Rose (1922), The Happy Garden (1928) and a Selected Poems (1936) received a certain amount of respect. They are the work of a singular, scholarly and spiritual individual seeking his own way to express wonderment. Childe was a friend of J R R Tolkien, and the godfather to his son Christopher. Indeed, if you were looking for a book that has even a hint of a Tolkienish atmosphere, you might do worse than turn to Childe's romance. 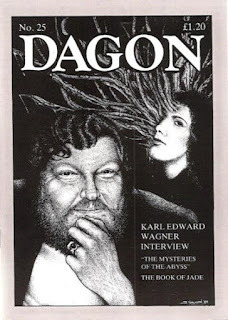 I seem to recall that Arthur Machen expressed approval of it too. 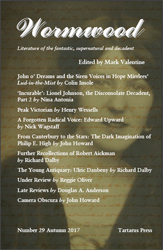 But his books have never received very much attention, and I was delighted to publish (in Wormwood 15) the only significant study so far, ‘Wilfred Rowland Mary Childe, With a First Attempt at a Checklist of His Published Work’ by Jonathan Wood. 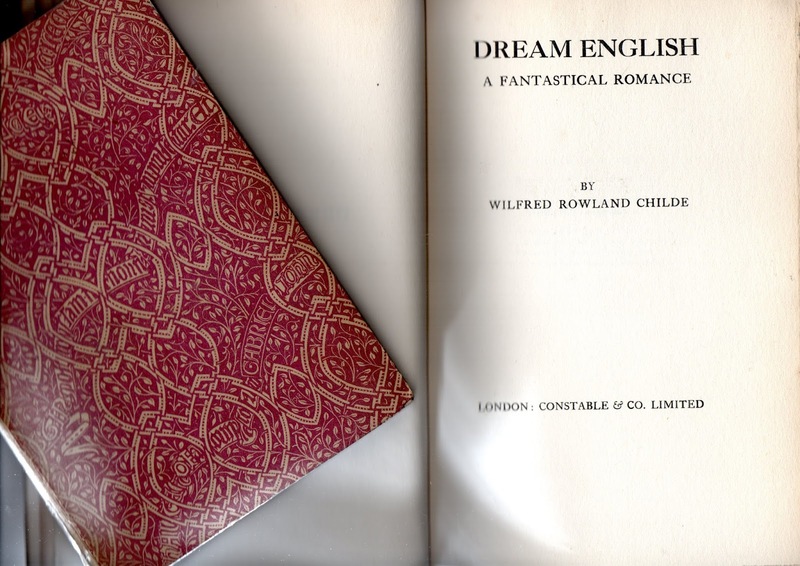 Picture: the title page of Dream English, with the cover of The Gothic Rose also shown. 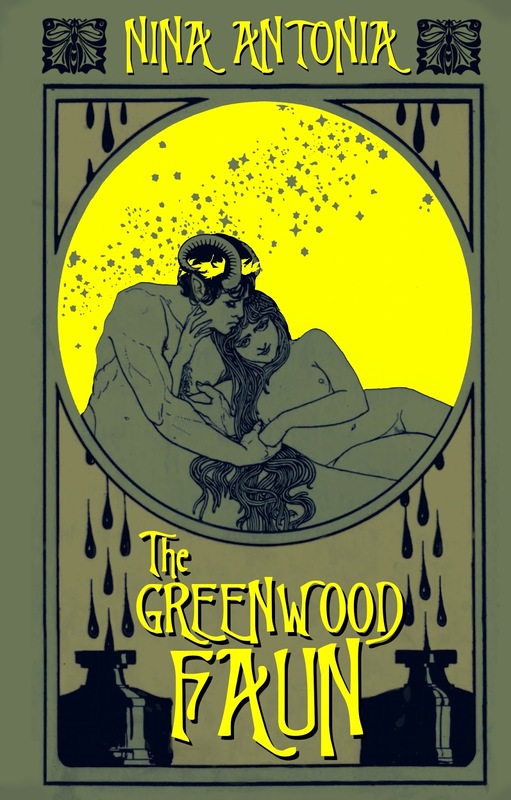 On Wednesday 13 December, from 6.45pm to 7.45pm, author and Wormwood contributor Nina Antonia will be reading from her new book, The Greenwood Faun (Egaeus Press), "a beautiful, otherworldy novel which draws on the lost writings of Lucian Taylor and Lionel Johnson, the natural world and the preternatural; blurring facts and fictions.. ."
The free event, with mulled wine, is at Putney Library. It will be followed by a short discussion on how the author's writing about music led to her interest in fiction. To book, ask in the library, call 020 8780 3085, or email Charlene[dot]Coleman[at]gll.org.